I admit, I am not much of a Din Tai Fung fan. IMO, there are a lot of other places in Sydney; such as New Shanghai or Taste of Shanghai (and even a few cheaper small shops) that can do their specialty - Xiao Long Bao - as good if not better, for fairer prices. But what to do when I crave for one item that no other place in Sydney could do better: Salted Egg Yolk Custard Bao / Lau Sar Bao / Liu Sa Bao. I keep coming back to Din Tai Fung for my fix. Even after experiencing Dian Shui Lou Taiwan - who many people deem a competitor to Din Tai Fung - I still think the latter's version is much much better. So with that as a mission, we went to Din Tai Fung main branch at World Square, Sydney. On weekends, dinner time at Din Tai Fung starts at 5 p.m. We arrived around 5 minutes past, and we were quite surprised to see the restaurants to be more than half full already. The business is looking good. Vegetarian Delights (A$6.80) is good for appetizer and it is a pleasant palate cleanser. 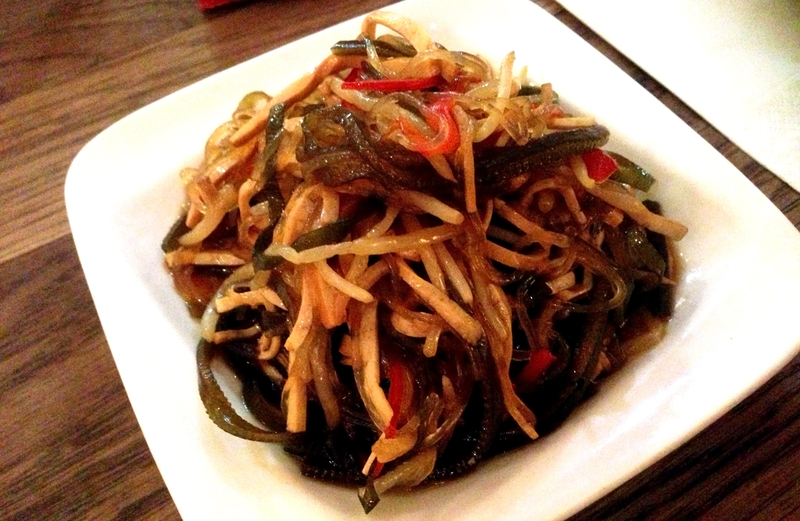 It consists of marinated seaweed, thin vermicelli, beansprouts, and thin slivers of tofu or tofu skin ( I think ). 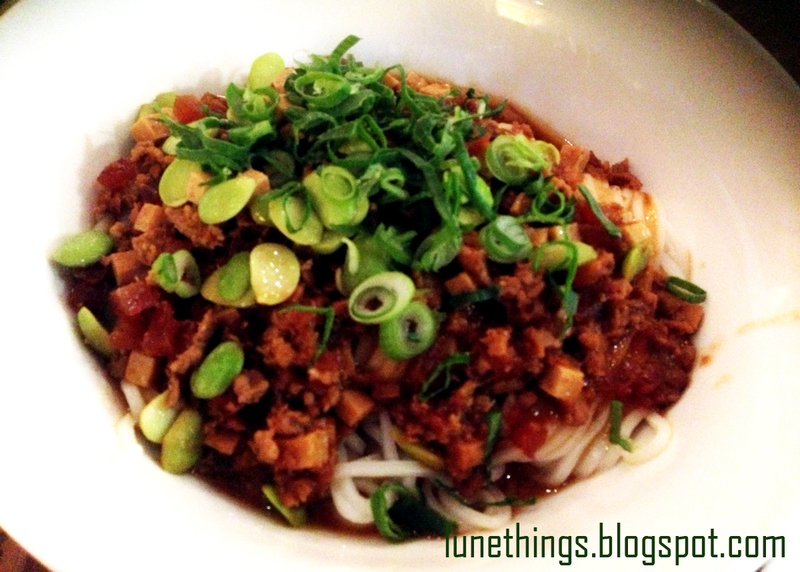 1/2heart tried Ja Jiang Mian (A$13.80) - a humble dish usually consists of noodles and marinated pork mince. The taste of the dish really depends on the marinated pork & the sauce. Din Tai Fung makes their own noodles and they are of good consistency with the right amount of chewiness. I also noted that they also added marinated beans to the sauce, that adds to the fragrance. It smells great, however I found the taste quite lacklustre. I have had better Ja Jiang Mian at a local Taiwanese eatery in Hurstville, for almost half the price. 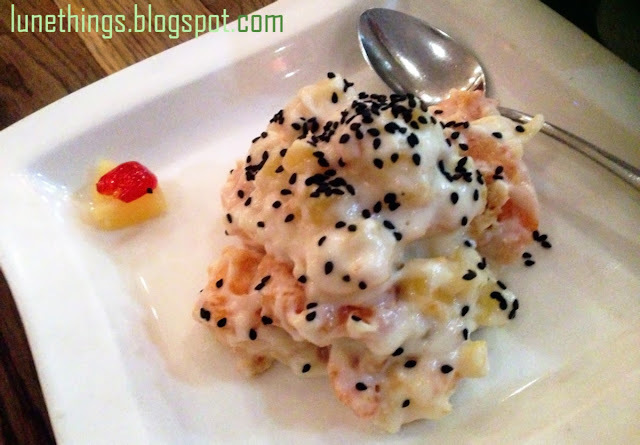 Prawns with Pineapple (A$20.80) - lightly battered fried prawns with pineapple pieces, smothered in sweet mayo. Prawns were big and juicy, but overall - very very sweet and actually made me quite sick after a few bites. 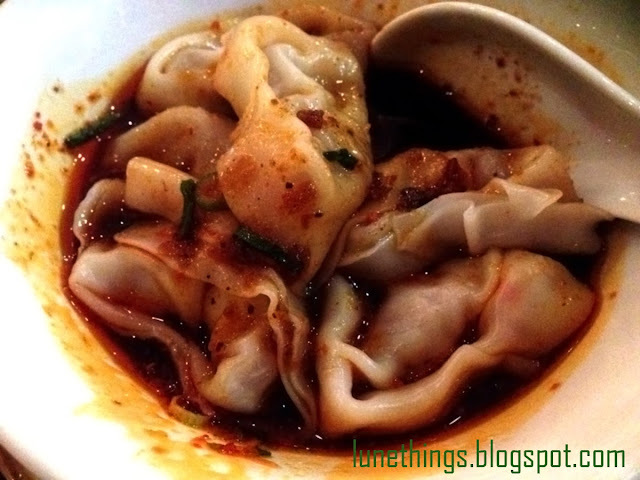 One dish that Din Tai Fung never fails to deliver - Prawn & Pork Dumplings in Spicy Sauce (A$10.80). Although I was on a mission for the Salted Egg Yolk & Custard Bun, I would never ever miss ordering this dish whenever I dined there. I love their sauce. Can someone teach me how to make that sauce mixture please? (I drank the sauce like a soup -_- the acidity of the vinegar component made my stomach quite upset afterwards). 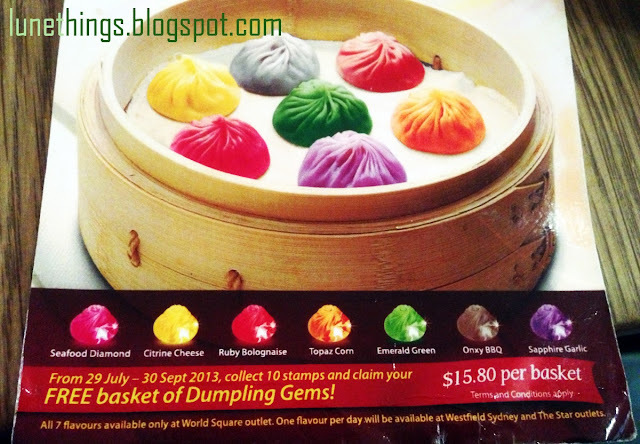 Full set of Xiao Long Bao Colored Gems costs A$15.80. Only the World Square branch has all 7 flavours. The other outlets at The Star and Westfield Centrepoint rotate their flavors everyday. The Trio Mini Buns (A$5.80) are Red Bean Bao, Black Sesame Bao, and Taro Bao. Black Sesame filling was too dry to my liking. Nothing special with the other two. The amount of buttery salted egg yolk and sweetness of the custard is just right. It felt like heaven in my mouth. I love this bao very much. 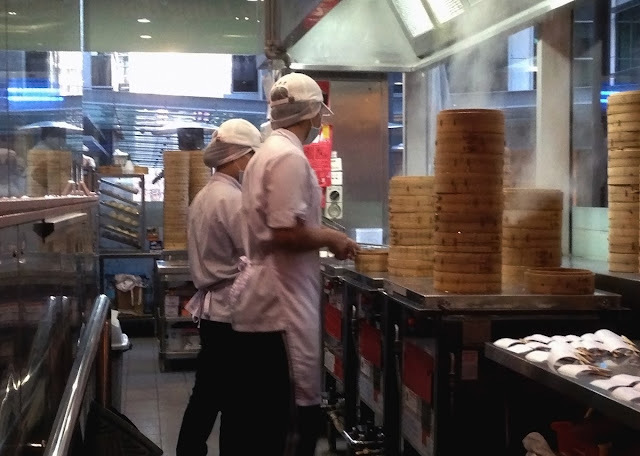 If you do know of another place that has as good Lau Sar Bao as Din Tai Fung's, please do share. You will make me a very happy woman.